Projected in the late 1960s and built between 1970 and 1974, the Heygate Estate was a product of the late phase of urban and architectural modernism in the context of the British Welfare Estate. After some years in good conditions, the estate, built near Elephant & Castle in South London, developed a negative reputation and social stigmatization. After a contentious process of eviction lead by the Council of Southwark, a set of 23 buildings containing 1260 housing units –home to about 12000 families– were demolished after standing almost empty for a decade. According to Southwark Council, one of the most ambitious regeneration projects in Europe is being developed in this “opportunity area.” The plan was strongly resisted by local campaigners and communities, due to the implied processes of displacement, gentrification, privatisation of public land, and the cutting of several mature trees that constituted a dense wood within the estate – issues all deriving from the depredating way in which market forces shape contemporary cities like London. In the years before being totally emptied, the Heygate turned into a silent garden detached from its busy urban surroundings, as if suspended in its own time. In that condition, it allowed space for the quiet contemplation of nature and a series of informal activities that gave a new life to an estate deemed as failed and redundant. 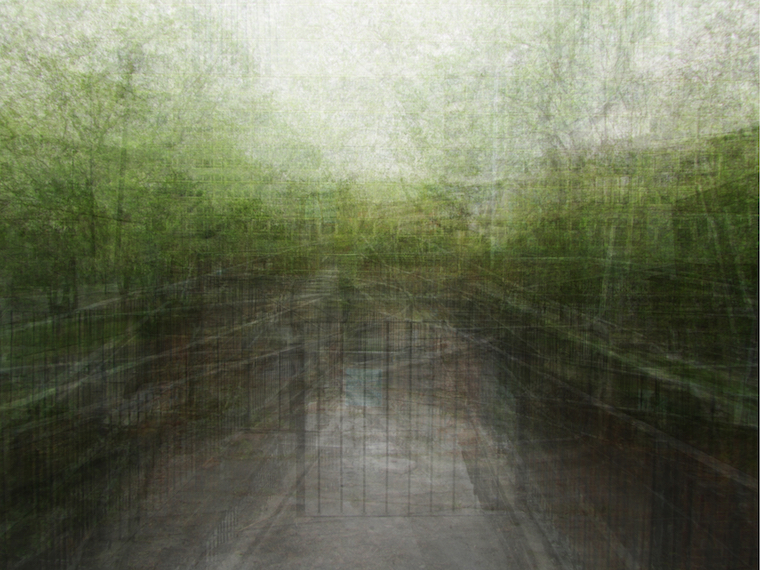 The first image is an overlay of photographs taken the 14th of May 2012 from an elevated walkway that externally surrounded the site, defining its north and east borders – a fringe between the Heygate and the city. The second image overlays photographs taken the same day but from an inner walkway of the estate. That walkway surrounded the mature trees and low-rise buildings of the site, defining the border between them and the external high-rise slabs of the estate. Bearing in mind that photography etymologically implies the writing or drawing of light, and that a photograph itself is a projection of the light of a past moment, the proposed images can be seen as palimpsests of light that recreate the environmental qualities of a place about to disappear. They represent it as an absence – a blurred, imprecise memory instead of a clear and fixed image of its former presence. 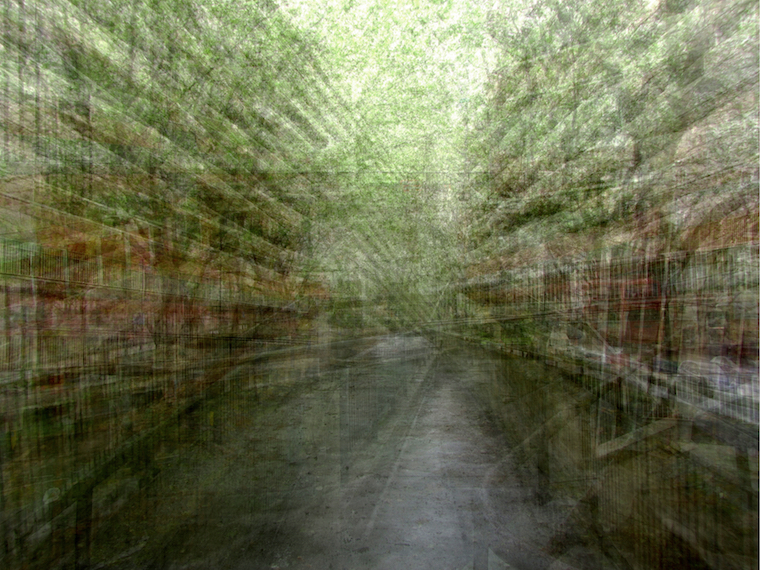 The resulting dense atmospheres of the images interrogate the materiality of the city and its persistence in time, revealing the Heygate Estate as an immaterial, vanishing ruin, months before its complete demolition. Both compositions not only condense a situation of physical border in urban space, they also represent a border of the site’s time, evoking a fading past and the sense of an uncertain future. These images were presented in the Society of Architectural Historians of Great Britain’s Graduate Student Forum, held in UCL in May 2013; the CHAT Archaeology Conference “Experience” held in UCL in November 2013; and the seminar “Derek Jarman: Sites and Spaces,” hosted by the UCL Urban Laboratory and the Slade School of Fine Arts in February 2014. They form part of the author’s Ph.D. by Architectural Design thesis “Absence through Layering, from experiencing urban leftovers to reimaging sites,” supervised by Ben Campkin and Jonathan Hill. Felipe A. Lanuza Rilling is a trained architect from the University of Chile (2004) and obtained his Master in Architecture at the Catholic University of Chile (2008). He has worked as a practicing architect, researcher and educator. His academic interests are in the areas of architectural and urban design, history and theory; having presented his research in conferences and exhibitions in South America and more recently in Europe. Through his investigations on the notion of absence in urban leftovers, Felipe explores processes of design and representation as a way of prompting alternative understandings and interventions in the built environment. He develops these ideas at the Bartlett School of Architecture, UCL, where he pursues a PhD by Architectural Design. As an architect, Felipe’s work has ranged from territorial planning and management projects to the architectural scale. He is co-founder of ‘Devilat + Lanuza Architects’ and has been an active member of Urban Transcripts since 2012, having been appointed as Design Director during 2013. In this context, Felipe has developed his passion for urban design and speculative thinking on cities.